From cover to synopsis, everything about this book made me want to read it. Once again judging a book by its cover worked out well, because the story between the covers was just as good as the picture outside. Nikki Beckett has spent a century in the Everneath, a realm in which immortals (Everliving) Feed on the emotions of humans. At the end of the century, Cole, the Everliving who has been Feeding from Nikki, asks her to stay, but instead Nikki chooses to Return to the surface. Once she Returns, she has six months before the Everneath claims her forever...six months to say a proper goodbye to her family and friends. Unfortunately, she can't just walk back into her old life. Her family and friends - even her old boyfriend, Jack - aren't quite ready to be completely trusting. And to make matters worse, Cole is determined to win her for his own. As her time runs out, Nikki must find out if there is a way to avoid the Everneath and the Tunnels altogether, looking for help in the most unlikely places...and the one place in which she could have found help all along. I love mythology, so I was very excited to read this retelling of the Persephone myth. I enjoyed that the basic tenets of the myth were brought into a modern-day setting and other similar stories from mythology were also included along the way. If I had to pick one word to describe Everneath, it would be intense. From the grief to the love, I could feel all of Nikki, Jack, and Cole's emotions. Even though things between Jack and Nikki weren't perfect for a long time, the bond between them was undeniable. And as for Cole, even though he is made out to be the villain, I can't help but think that there is more to him that has yet be seen. Beyond this, the writing of Everneath was excellent. I was completely drawn into the story and its mystery and did not want to put this book down until I knew everything there was to know. Because we get to see not only the present day but also Nikki's flashbacks to the time before the Feed, I felt so much closer to her and Jack. I am already dying to know how things work out for them in the next book. I do wish that Nikki had been a bit of a stronger character. Even though I could sympathize with her, some of her decisions frustrated me. I also would have liked to see a bit more with her brother - even though he was important to her, I felt that the relationship was glossed over a bit more than necessary. My only other complaint is how long it will take for us to get the next book - I need it now! 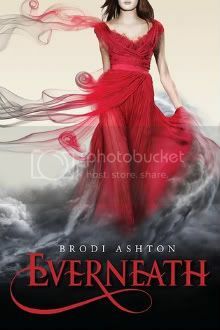 In Everneath, Brodi Ashton wove a story full of passion, love, loss, and life. This was a fabulous debut, and I cannot wait to read more from her! I loved this book too! Great review. :) The cover is so awesome.